The armored personnel carrier's (APC) role is for the safe transportation of infantry through hostile territory. It is lightly armored but more resilient to attack than the Jeep, while generally sacrificing speed. However, by installing a better engine once one has been researched will allow it to travel across the battlefield much faster, making it much more effective in it's role. On the map APCs show up as moving blue(BE) or red(NF) dots (just like the barracks) and players may choose to spawn inside of them. Respawning players will appear inside of the APC if there is space available. If there are no empty seats, the player appears outside of the APC. 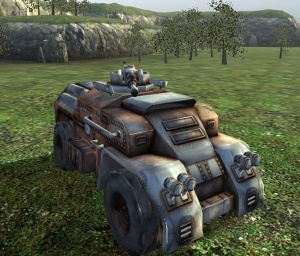 When in one of the APC's passenger seats, a player will collect health and ammo automatically until full. In the Brenodi APC, the passenger in the second seat will spawn in an open topped compartment, where they will be able to shoot and throw grenades from. However, they can also be shot at while in this seat. Accuracy in this seat is equivalent to standing accuracy. This page was last modified on 18 July 2016, at 17:47.